Home to authentic Jiangnan dishes, Old Bailey is where you'll also find Shanghainese dim sum and xiao long bao. If you’ve been wondering where to grab a bite after exploring Tai Kwun, this is the place to go. If you missed Design Miami last December, British artist Bethan Laura Wood’s installation from the show—titled "Hypernature"—will be coming to the restaurant this month. Commissioned by Perrier-Jouët, Wood’s installation takes the form of a tree crafted from man-made materials, including stained glass and sheets of aluminium. The installation will be at Old Bailey from now till March 29. With its unique combination of serving up both food and art, Cobo House is also known for its luscious sharing plates—from urban farmer flatbread to mafalde pasta with roasted pork neck—served in a stylish, understated and relaxing setting. During art week, Cobo House will play host to Roth Bar & Grill, the restaurant housed within the Hauser & Wirth gallery based in Somerset, England. The pop-up will offer two tailor-made cocktails and two special dishes that combine local flavours and British ingredients. Gallerists Iwan Wirth and Adrian Cheng will curate selected artworks to be displayed in Cobo House during the pop-up as well. The promotion runs from March 25 to 31. The hotel’s collaboration with the renowned art consultancy CONSIGG returns to Mandarin Grill this month, with an exclusive menu mainly drawing inspiration from Russian artist Konstantin Bessmertny’s works. While admiring Bessmertny’s, and other artists like Li Jin’s and Kato Izumi’s artworks, guests are able to enjoy delicate courses as inspired by the paintings, namely—“Tin” (caviar, leek and cauliflower), “Slash” (horse mackerel, miso and black garlic), “Sound, Body & Mind” (pork belly with onion and apple), “5 Elements” (smoked wagyu) and lastly, “Untitled” (passionfruit sorbet with raspberry and chocolate). In addition, all the art pieces that displayed throughout the restaurant will be available for sale, as well as Konstantin’s “7 Deadly Sins” show plate. The menu is priced at HK$1,488 per person, available from now till March 31 with two sessions—2:00 pm to 4:00 pm and 4:15 pm to 6:00 pm. Duddell’s is probably one of the most iconic venues to visit in town during art week, thanks to its mix of art gallery and dining room. This year, Duddell’s is hosting a joint show—Enlightening Times, featuring Mainland Chinese artists Wang Guangle and Li Shurui. All works on show are from the collection of young art collector John Dodelande and were chosen for this show by curator Jérôme Sans, co-founder of the Palais de Tokyo in Paris. Offering you superb Cantonese food, all-day dim sum delights and a wide array of libations, Duddell’s simply allows you to appreciate art and food in the most stylish and relaxed way. The exhibition will be held from March 24 to June 23. In celebration of art month, The Lounge at Four Seasons introduces a playful and elegant afternoon tea set to satisfy your tastebuds. Prepared by executive pastry chef Ringo Chan, the tea set takes guests on a whimsical ride with its edible art pieces. 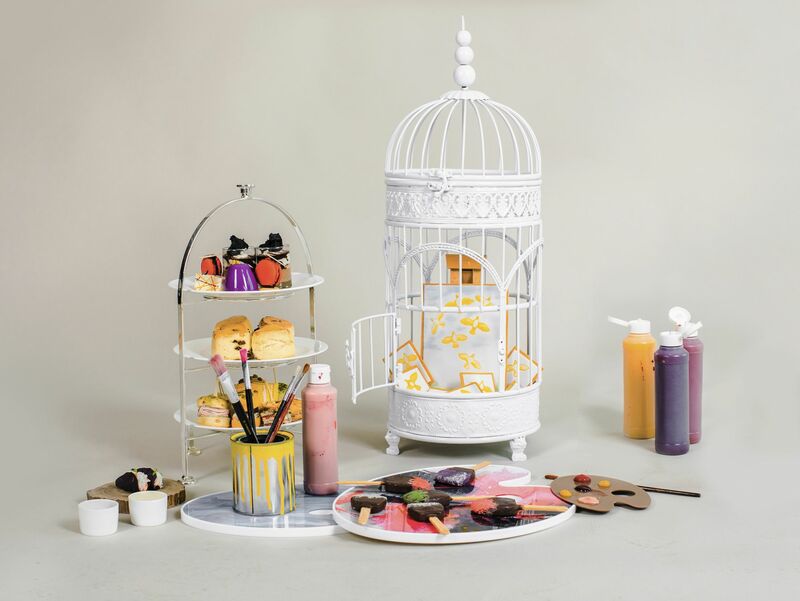 On top of the classic pastries that are served on the three-tier stand, guests can savour a creative collection of desserts, such as “Building Forest”—a creation made with premium cream and sugar as an interpretation of Hong Kong’s urban jungle—as well as “Let Me Free”, almond cookies with bird paintings that are served inside a bird cage. You can even create your own masterpieces by using edible tubes of pastel paint to decorate the cookies—it’s never been a better time to unleash your inner artistic talent. The interactive afternoon tea set is priced at HK$438 per person, available on every Sunday this month with two sessions—from 2:00 pm to 4:00 pm and 4:15 pm to 6:00 pm. Between gallery hopping moments, it's vital to chill out with some exquisite cocktails—and Mrs. Pound is the place to be. The restuarant will be pouring limited-edition art cocktails inspired by Vivienne Westwood, which is sure to make any art and fashion lovers’ hearts skip a beat. Westwood’s belief in sustainable fashion and practice of using recyclable design materials are the motives behind these aesthetically mesmerising cocktails. “My Way” is made with elements of an entire grapefruit, that perfectly matched with Mrs. Pound’s fresh grapefruit juice, Tanqueray Gin, lime juice and egg whites. “Say Cheese” is also available for those who prefer cocktails with a richer flavor, thanks to its mix of Michter’s rye whiskey, blue cheese fat-washed Tio Pepe, Campari and black walnut bitters. These special art cocktails are only available throughout March. The award-winning Thai restaurant has long been a favourite among food lovers for not only their impressive delicacies, but also its location at Tai Kwun—one of the most high-profile and artistic cultural destinations in Hong Kong. Diners will be able to enjoy a wide array of palate-tantalizing dishes prepared by Aaharn’s new head chef Boonyapat Pariyasakul and his culinary team, such as aromatic curries and refreshing prawn and basil salad. What makes these authentic treats extra pleasant is that, the restaurant has been revamped into a gorgeous and artistic space filled with Ben Brown Fine Arts’ artworks, that will take your dining experience to another level. Regular lunch menus with two courses and three courses are priced at HK$198 and HK$228 respectively, available from Tuesday to Saturday every week. Tatler 500 lister Bonnae Gokson’s restaurant Sevva is still a favourite when it comes to the city’s most stylish al fresco venues, with its comfortable, imaginative and luxurious atmosphere. For this year’s art month, the style icon is collaborating with her close friend and renowned Belgian interior designer Gert Voorjans, to transform the restaurant’s lounge into a vibrant and aesthetic new space. Adorned with Voorjans’ artworks and his fabrics crafted together with Jim Thompson, the pop-up is designed to immerse guests into a garden-themed wonderland. With signature dishes such as crispy fried chicken, dosas and delectable cakes served with a spectacular view of Central, Sevva is just perfect for an artsy date night. Following the pop-up, Sevva will be temporarily closed for a major revamp with a new look unveiled in autumn this year. Knowing as the official hotel partner of Art Basel Hong Kong, The Peninsula is launching the exclusive Felix Five Senses Art Experience feast to play on and satisfy all your five senses—sight, hearing, taste, smell and touch. With contrasting colours and rich textures, this menu is not to be missed for any art and food connoisseurs. Delicately crafted by chef Juan Gomez, diners can anticipate delights including semi-dried tomatoes and almond vanish ravioli with Jerusalem artichoke cream, white chocolate textures with whiskey chocolate ganache and verbena sorbet, that are served with stunning views of the Victoria Harbour. After enjoying these vibrant flavours, you can take a closer look at the immersive, unique installations by contemporary artists around the hotel, such as Timothy Paul Myers’ bellhop carts-inspired piece and Janet Echelman’s installation that floating over the historical frame of the hotel. The menu is priced at HK$1,288 per person, available from now till May 30 for a minimum of two people from 6:00 pm to 10:30 pm daily. Whisk at The Mira Hong Kong has unveiled an art-inspired degustation menu with pop art-inspired cocktails. A pop-up exhibition, “Reflections” by the UK-born, Hong Kong-based artist Szabotage will be held at the restaurant’s wine lounge from March 28 till April 22—alongside exquisite art-inspired six-course menu prepared by chef Oliver Li. The menu, “The Gallery of a Hong Kong Chef” is infused with both street art aesthetics and urban culture flavours. You will get to savour dishes such as Szabotage’s “Koi-D Black/Purple” graffiti-influenced grouper tinted with seasonal veggies, and fluffy Chinese-style bun filled with Japanese wagyu. Four special cocktails that draw inspiration from the bold and colourful spirit of pop art are also available at the al fresco lounge bar Vibes, making it the perfect post-Art Basel chill spot. The six-course menu is priced at HK$890, available from March 29 to April 27, Monday to Saturday from 6:30 pm to 10:00 pm. The four pop-artsy cocktails are priced at HK$128 each, available from March 29 to April 21, and HK$88 each during happy hour from 6:00 pm to 9:00 pm. Arts Poll: Would You Buy Art Over Instagram?